Hi - loving the ORK Framework so far, awesome work! 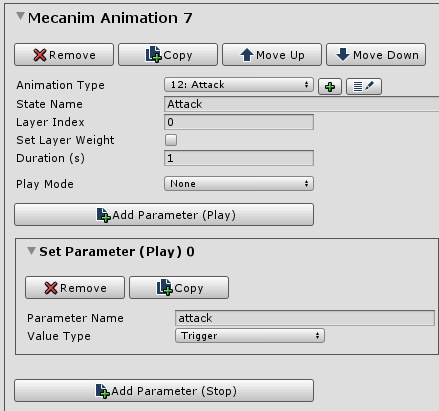 I have Mechanim animations set up for a 2D prefab, and about half of them work out of the box using your Mechanim tutorial. Specifically, Attack and Defend seem to throw some "Parameter: Hash does not exist" errors when they should be triggered. Since *some* of the animations work, I'm guessing ORK is interacting correctly with my Animator component so that's good, but I'm a bit baffled about the others. Hm, please check the spelling of the parameters again - beside being case sensitive, also check if they maybe have a space added or something like that. The error/warning you get hints at the parameter name not matching in ORK and the animator. If I tick the triggers while the game is running, the animations fire, so yeah. I'm guessing ORK can't find these parameters somehow... so weird. Hm, do you have multiple layers in your animator? You could try adding the layer name to the parameter name, e.g. "Base Layer.attack". No, I don't have multiple layers, and adding the layer name didn't do anything. I noticed this when I tried triggering the animator through a script, which can be done with either a string or an int parameter. The string value "attack" triggered the animation, but the error message I was getting from ORK seems to be reading it as an int? I should have added the full error message from the start, sorry. 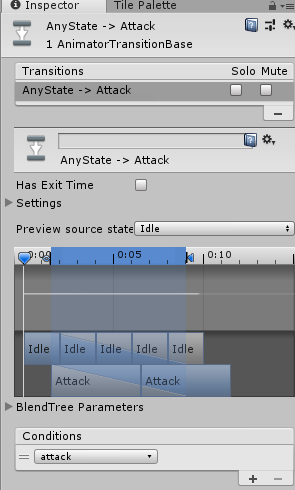 The long int values are consistent (i.e., this specific number is always the non-working "attack" parameter). Hm, yeah ... strange. ORK uses Unity's functionality (as stated by their own tutorials/documentation) to generate the hash key for the parameter name, mostly because it's a bit better performance wise.